Here is a French vintage seed label for zinnias. 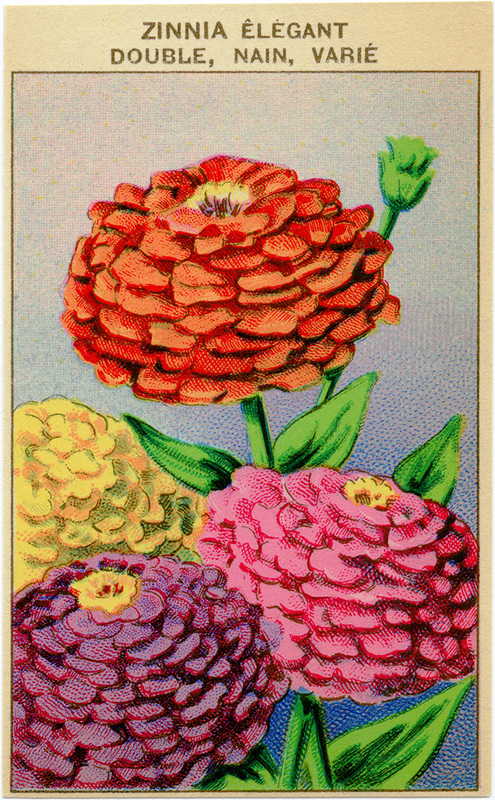 The label includes an illustration of four pretty flowering zinnias, each a different color. The description on the label is Zinnia Elegant Double, Nain, Varie. This type of vintage seed label would have been pasted on a seed packet or jar of seeds for retail sale. Click on image to enlarge. Zinnias are my favorite….old fashioned….and remarkably sturdy and bloom worthy! I’m going to make seed packets from this image and put seeds in them for friends! Thanks so much! You’re welcome Patricia. I don’t think I’ve never planted zinnias but if they are sturdy and bloom worthy perhaps I will try growing some next year. Thank you for the information. I love your idea to make seed packets with seeds in them for your friends! Thanks, the seed packets are my very favorite vintage graphics. You have posted several very nice ones lately. You’re welcome Sharon. I’m happy to know that you are enjoying the seed packets. I really like them too.